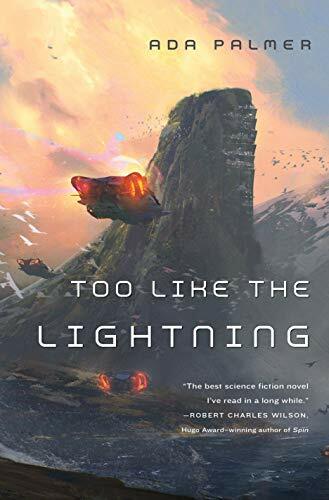 Ada Palmer’s new book, Too Like the Lightning, will be out next week, and she kindly stopped by to chat about it, and more! Will you tell us a bit about Too Like the Lightning and what inspired you to write it? I wanted to write something that would feel like the way science fiction and fantasy were written in the Enlightenment. I know most of us think of SF as a modern genre, but lots of pre-modern fiction had fantastic and speculative elements, and Voltaire even wrote a short story called “Micromegas” in which aliens from Sirius and Saturn come to the Earth and make first contact. A lot of modern F&SF novels use a fairly standard, somewhat neutral narrative voice, but I love the voices of Enlightenment literature whose narration is so intimate and opinionated, directly addressing the “dear reader” and sharing the speakers fears and inner feelings as if they were writing a letter to a dear friend. I love how works like Candide or Diderot’s Jacques the Fatalist cultivate an actual emotional relationship between text and reader, and how part of what you’re exploring is the story, but part of it is exploring the mind and opinions of the author. So I wanted to design an exciting science fiction future—something optimistic and almost golden age with flying cars and a Moon Base, the kind of future both classic SF and Enlightenment authors were hoping for—but explore it through the voice of a very strong, period-style narrator who would, like eighteenth-century authors, filter everything through his own palette of political, metaphysical and moral assumptions and questions which are very different from our own. That lets you taste and feel the inside of a mind that inhabits 2454 the same way Candide lets you taste a mind from 1759. My favorite history teacher always said that, if you got sent back in time, learning to understand people’s mindsets, how they thought, would be by far the hardest part of the adjustment, since people from another time are alien to us in so many ways, and when you read old fiction you can see it, how the thoughts and assumptions of an ancient Roman or a Medieval Frenchman much more alien than any alien Star Trek ever depicted. I wanted to write science fiction with that kind of aliens, people alien to us in mind because they’re alien in time. Why do you think readers will root for Mycroft Canner? Will you tell us more about him? Mycroft tells you in the first paragraph that you will hate him, and it’s precisely that kind of honesty which makes people develop such affection for him. He’s very intimate as he addresses the reader, sharing things that make him nervous, baring parts of himself, secrets and past crimes that he’s ashamed of, and constantly apologizing for his weaknesses, promising to do his best. Everyone who reads the book comments on the voice, how distinct it is from the way most fiction reads these days, and how Mycroft’s intense sincerity in his efforts to serve the reader wins people over, even when he interrupts for long philosophical tangents, or when he refuses to explain something saying you won’t understand it yet (begging you to be patient and trust him), or when you find out terrible things about his past, as he says you will. What secondary characters did you particularly enjoy writing about? They’re all fun—if you ask me who my favorite character is I usually answer whoever I was writing this morning, since I get immersed, and love them all in different ways. I hate to spoil things so I won’t talk about the most intense characters, but several of the characters are great political leaders—kings, presidents and emperors—so it was fun to design how they would act and be perceived a few centuries into Earth’s political future. Carlyle Foster is fun to write because Carlyle is a theologian/metaphysician by trade, so has great reactions when something supernatural happens. A lot of times you read a book where something supernatural happens and characters’ reactions are something like “Let’s use this to get rich!” or “Let’s try to monopolize this and kill everyone else who knows about it!” but Carlyle’s reaction is “Let’s get out our big encyclopedias of the history of philosophy and figure out what this tells us about the nature of the universe!” which really is the only sensible reaction when something has happened that could transform everything humanity knows about the universe. There are also some characters who speak Latin, and think in Latin, so while only a little of the dialog appears in Latin (there are translations too, don’t worry) I enjoy always thinking about how the character would phrase it if it were Latin and making the English reflect that structure. In your bio, you talk a lot about structure and pacing in a novel. Will you tell us more about the structure of Too Like the Lightning? The book is structured as a history, being written by Mycroft Canner “at the request of certain parties” as he tells us, so all the way through there is the second level of thinking about when Mycroft is writing it, why he has been told to write it, and what the historian Mycroft knows that the Mycroft running around amid the action doesn’t know yet. The history has also been censored, and the first page lists all the different political groups and individuals which have examined the text and given permission for its publication. You can learn a ton about a world by seeing what it censors, and what people have the power to censor things, so having that up front sets up a structure in which you are constantly piecing together the anxieties of this world, and coming to understand why different authorities have power over different kinds of information. You’ve been writing since a very young age. Don’t suppose you’d want to tell us more about that first novel project in fourth grade? Ha, that one. “Children of the Forest” it was a vaguely Robin Hood story, about a bunch of animal spirits living in Sherwood Forest who were the sons and daughters of Herne the Hunter. There was a king who’d been overthrown by his cousin and imprisoned (think Richard II or Henry VI) and they were going to rescue him and restore the kingdom. I’d been watching the old BBC Robin of Sherwood TV series, and reading a lot of Brian Jacques. At that point I didn’t know that raccoons only live in the Americas, so one of the main characters was a raccoon-boy, which, if you think about it, would have been fascinatingly baffling in Medieval England. Why SFF? What do you enjoy most about writing, and reading, in the genre? I love genre fiction for the same reason that I love history, because it’s about different worlds, different minds, and seeing the actions of people who live (or think they live) in different universes from our own. When I read a history or a biography of some historical figure, people constantly make choices and take actions that no one in the modern world would ever think to take, actions that are baffling, fascinating, mad, and wonderful, because historical figures have their own ideas about how the world they live in works and choose accordingly, using their morality and their universe, the universe they believe in, not the one we believe in now. I love that, and I love how science fiction and fantasy offer the same. Ursula Le Guin has called speculative fiction authors “realists of a larger reality” who imagine other ways of being, and explore alternatives, different ways the world could be, exploring possibilities of change, and hope. That’s why both history and speculative fiction excite me the same way, and I think she’s right that there’s something broader, more open to discovery and novelty about literature that explores many worlds and many possibilities, instead of literature of the familiar world which often just looks at the experience of being trapped in its familiar problems, without the optimism or ambition that comes from looking at what could be as well as what is. I like metaphysics. I like when a world has an interesting, distinctive metaphysics, either spelled out at the beginning, or revealed bit-by-bit as you gradually learn how this universe works. I read a lot of horror even though I don’t particularly like being scared, because horror often has wonderful pacing of revelation toward a fascinating and original metaphysics. Enlightenment works are like that too, in their way, since Candide is about exploring how Providence might work, and Jacques the Fatalist is about exploring what a world might be like without Providence (which is innovative and speculative when written in a century when Providence was the assumed default). The thing that throws me out of a story most is if it becomes clear that the metaphysics doesn’t fit together, either that it’s self-contradictory, or that the author is just throwing things in without it actually fitting together into a big picture. My favorite books are all good the second time through too, and I really enjoy rereading because I can see more the second time through, both details I don’t catch the first time and elements of the way the author crafted the story which are more visible when you know the whole shape. So all my favorites—The Book of the New Sun, The Stars My Destination, Empire Star, even my favorite comics like Watchmen, Phoenix, Pluto & Uzumaki—are even better on the second pass. Mine are designed to be better on the second pass too, with lots of details in book 1 that mean something totally different if you’ve read book 2. I guess my pick for something to experience again for the first time would be Diderot’s Jacques the Fatalist and His Master, because that’s a book that’s mostly about pushing the envelope of how you can structure a story. As you read it, Diderot keeps doing more and more things that violate the normal structure of a story, helping you realize how many unspoken rules there are that you never expected any author to break. We assume all these promises—that the stories will have a particular structure leading toward a climax, that characters and details will have particular relationships to that structure, that the content will cohere in certain ways—but by the time you finish Jacques the Fatalist you realize that the only real contract between reader and author is that, at the end of each sentence, the reader will want to read the next sentence. Reading Jacques the Fatalist for the first time completely transformed how I think about the relationship between reader, author and text, and that mind-bend would be fun to have again. What are you currently reading? Are there any books you’re looking forward to diving into this year? Most of my reading time is taken up with books for work, so right now I’m reading Orlando Furioso, Petrarch’s De Remediis (Remedies against good and bad fortune), and Guido Ruggiero’s The Renaissance in Italy: a Social and Cultural History of the Rinascimento (highly recommended for history buffs—it’s a super detailed readable account, amazing on culture!) For fiction I’m in the middle of the brilliant horror short story collection The Weird (edited by Jeff & Ann VanderMeer), which I love because the stories are arranged chronologically so you get a history of the evolution of weird fiction over the last century and a half, and thanks to it I’m also reading the collected short fiction of Michael Shea (his story “The Autopsy” in The Weird is so good!!). 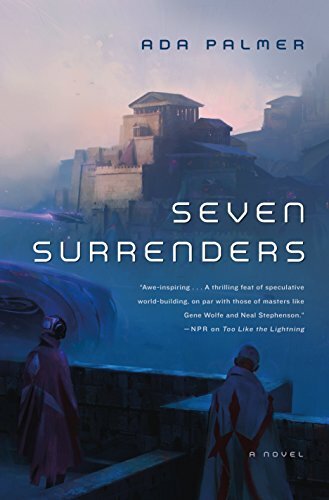 For new fiction I’m enjoying the Tor.com novella line, especially Sunset Mantle by Alter S. Reiss, since novellas are easier to squeeze into my schedule than longer things. For future stuff I’m excited by the speculative politics of Malka Older’s Infomocracy, which has some parallels with my own though it’s much nearer in the future, and I’m really excited for Wintertide by Ruthanna Emrys, a novel to go with her amazing short story “The Litany of Earth” (on Tor.com) which uses the Lovecraft universe (with its great metaphysics!) but turns the culture and point of view up-side-down. Wintertide won’t be out until 2017 but the editor promised me an early copy. The second book comes out in December, so there isn’t too long to wait! These first two are a really closely-knit pair, the two parts of Mycroft Canner’s history, so I’m really glad I was able to get book 2 done fast, so they can come out so close together. Book three is also finished, and book four is well underway, so I’m happy to say the whole plan is coming together, almost complete, so there won’t be any long waits. I can’t wait until people have read more so I can talk to them about it! Ada Palmer is a professor in the history department of the University of Chicago, specializing in Renaissance history and the history of ideas. Her first nonfiction book, Reading Lucretius in the Renaissance, was published in 2014 by Harvard University Press. She is also a composer of folk and Renaissance-tinged a capella music, most of which she performs with the group Sassafrass. Her personal site is at adapalmer.com, and she writes about history for a popular audience at exurbe.com and about SF and fantasy-related matters at Tor.com. Ada Palmer, interview, Too Like the Lightning.